I know this is long overdue, but better late than never! As you might imagine, a lot has happened on the farm since my last newsletter. So let’s get to it. 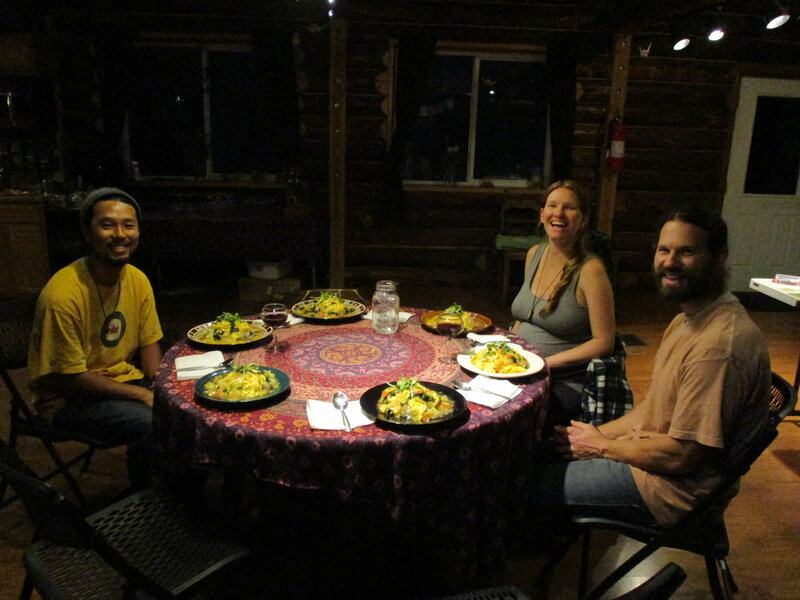 Probably the best thing that has happened to the farm thus far was the integration of outside farm help – mainly in the form of WWOOFers (volunteers for World Wide Opportunities on Organic Farms). After realizing that we don’t necessarily need to be a polished farm to participate in the program, we immediately signed up to be a host farm, and not long after we got our first WWOOFers, Emily and Nina from California who did an incredible job completely weeding our couple of garden beds and planting them back out. They also seeded clover around the perimeter of the pond area, and also helped gather freshly cut biomass for composting. They stayed for the better part of a week and then moved on to experience more of Alaska before heading back south on the AlCan. Cody was next, who was such a prominent fixture on our farm – eager to help in any way she best could, and so naturally became part of nearly every aspect of the entire farm. She anticipated priority tasks before I ever had a chance to say anything. What an absolute godsend who Mindy and I are truly hoping can join us at any capacity in the future! Next came Armelle, a French transplant from California who was ready for a change in her career and a freshening of her state of mind. 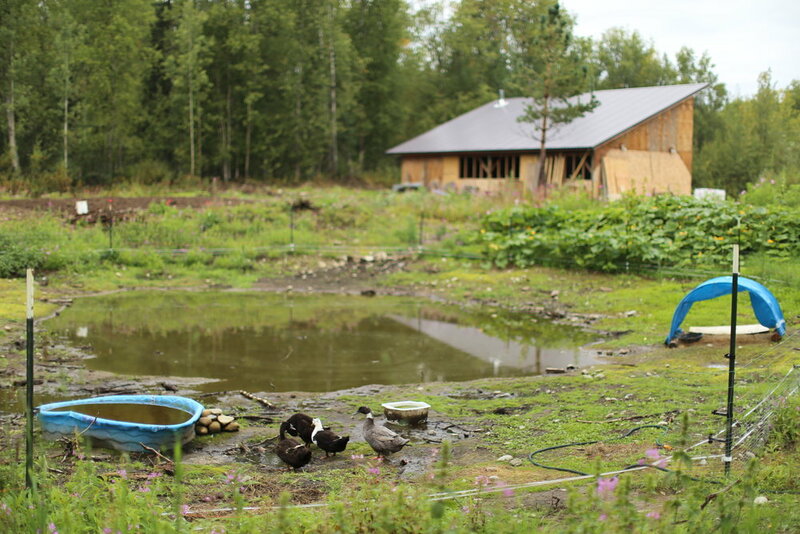 What better place than an Alaskan farm to garner such a breath of fresh air?! Armelle immediately and quite intuitively took control of the micro greens operation, which totally freed my days up to organize, plan, and take on other such administrative work. 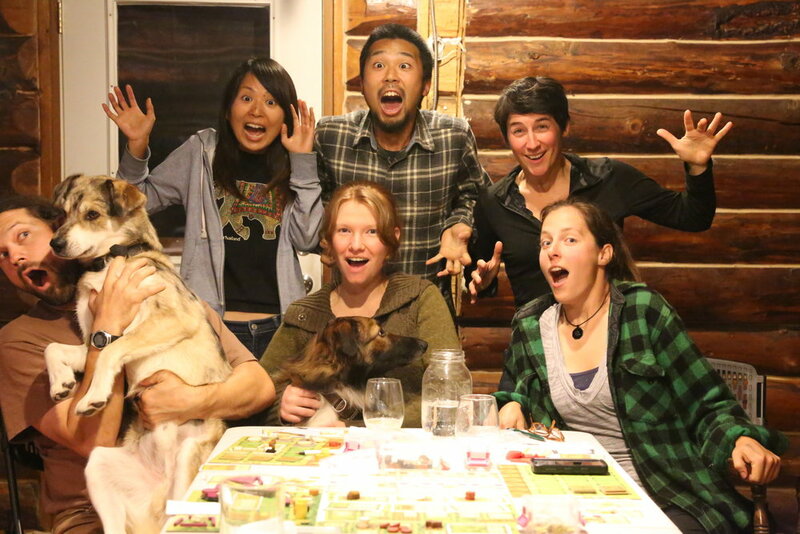 Rounding out this diverse group, were Taka and Konomi, an absolutely lovely and incredibly kind couple from Japan. Having very similar desires that Mindy and I do with this place in terms of self-resiliency, sustainability, etc., Taka and Konomi seemed to really be enriched here, gaining useful insights and envisioning their future farming operation that they are currently planning. Like those before them, their approach to working and contributing on farm was just stellar. The times we shared with the WWOOFers this year really refreshed and inspired us, and reminded us why we’re doing what we’re doing. People coming together with similar values and passions, and doing great things and having tons of fun while doing it. In our time together, there was no shortage of sweat, laughs, good food, and camaraderie! It worked, we have a pond! It’s not the biggest, most ecologically diverse, or beautiful thing to look at just yet, but just you wait until all the spring run-off. For those of you who may not have followed my blogs in the past, we had a bit of earthworks done last spring in an area that was already a large depression in the landscape. After the earthworks were performed, we then used a completely biological technique with our pigs in this depression called gleying, where the pigs were kept in the area and by the compaction of their hooves, that pond is going to be the drainage for a very large area. I’m actually a little concerned that it may back up a bit into the parking lot or reach out into the yard a bit. In future summers, this is going to be great irrigation, duck habitat, emergency water supply, source of humidity around the garden area, and ecological diversity enhancer. Not to mention greatly decreasing the erosive destruction it was causing before and hopefully keeping the barn from flooding every spring. Farmsteads LOVE ponds and its functions are going to be nearly endless. I’m very happy to say that our perennial system got a great start last summer and should be pretty well established and ready for propagation around the farm. We likely, however, suffer a bit of a setback with the moose pressure that we’ve gotten this winter. We pretty much asked for it, since the moose activity has been quite reliable and consistent every winter since we’ve been here. It just had to witness for myself that they would munch on my expensive and hard-earned plants, bushes, shrubs, and trees that were planted, and sure enough, they did. They definitely did some damage to my hundred or so small apple rootstock seedlings, but really just a few others. So we’ll see how many were fatally wounded and how many want to try to hold on. And this is all to say nothing about the -36 cold snap we had. 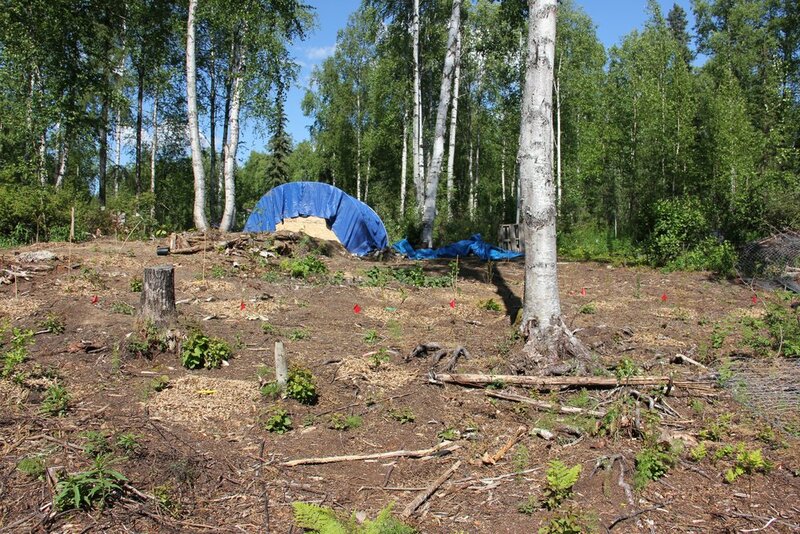 It’s the harsh reality and challenge of living and farming in Alaska. Otherwise, we got a handful of gooseberries and a couple handfuls of blueberries last summer from some early bearers and very much look forward to more of those this coming summer, as well as hopeful production from our aronia, jostaberry, honeyberry, and seaberry varieties. Fingers crossed! The micro greens program is taking a big leap forward this winter with the continued growth and improvement of the CSA program. While still encountering some delays here and there due mainly to temperature control issues, I have made major improvements in that arena and have increased growing capacity and greatly improved processing infrastructure with the addition of a water supply and a few sinks and countertops in the grow the room. Huge! And it certainly wouldn’t be possible with the support from you all and the confidence that I’ll get continued business in the futre. I’m more than happy to show anyone the operation who is interested. Just give me a heads-up and come on over! The other big leap in the program is the addition of a few drop-off locations in Anchorage. Thank you Taz Mannix for your love of these delicious greens and your efforts in acquiring enough members for me to make it worth my while. And a big thank you also to Karen Mannix for your willingness to help with transportation. Not sure where this is going to go, but it is sure encouraging to at least dip my toe in the water of such an enormous market and the potential that is Anchorage! The raising and butchering of about 35 meat chickens was both a satisfying and exhaustive affair! Without the use of a mechanical plucker or scalder, a Cody, Armelle, Vanessa, and I slogged through the arduous task of processing these birds that took a few days to do. With another hand or two and the aforementioned pieces of equipment, it should take maybe a half a day. As of now, we are not planning on doing meat chickens this coming summer. We have enough on our plate and an already exhausted budget for acquiring what we feel are the necessary investments in the operation (i.e. that plucker and scalder). It’s certainly not to say we won’t be doing them in the future. Stay tuned. Last spring, our lovely gilt, Gretel became a momma and had a litter of 9 beautiful piglets! We were so proud of her mothering abilities and her demeanor through the whole situation. We sure hope that she will be giving us piglets for many years to come! Of those 9 piglets, we sold 4 shortly after weening and raised the remaining 5. Of these 5, 4 were being raised for slaughter and 1 female was to be kept to breed alongside her momma. Great work, Willi and Ellie! Slaughter day is never a fun day on the farm, but there is a certain level of appreciation that is felt when knowing that you raised an animal the right way and that you’re now coming to this climactic point in your relationship with the food that you’ve put so much intention into. It’s a beautiful thing. In pondering how to go about getting these pigs butchered, we acknowledged the legality challenges that exist when it comes to butchering animals for selling. For reasons that are too lengthy to discuss here (perhaps I’ll write a future blog on the subject), for now, know that in a nutshell, we simply cannot sell meat that’s been butchered anywhere other than a USDA certified kitchen. After much pondering, we concluded there were a few options. One, customers could come take their live pig to butcher at a location of their choosing. We could potentially transport a pig to the butcher for them to pick up after it’s been butchered. Or, we could hold a butchering sort of event at the farm, and assist those in the butchering of their own pigs. After surveying all those who had a share in our group of pigs, it was the latter that proved to be most attractive to our customers. 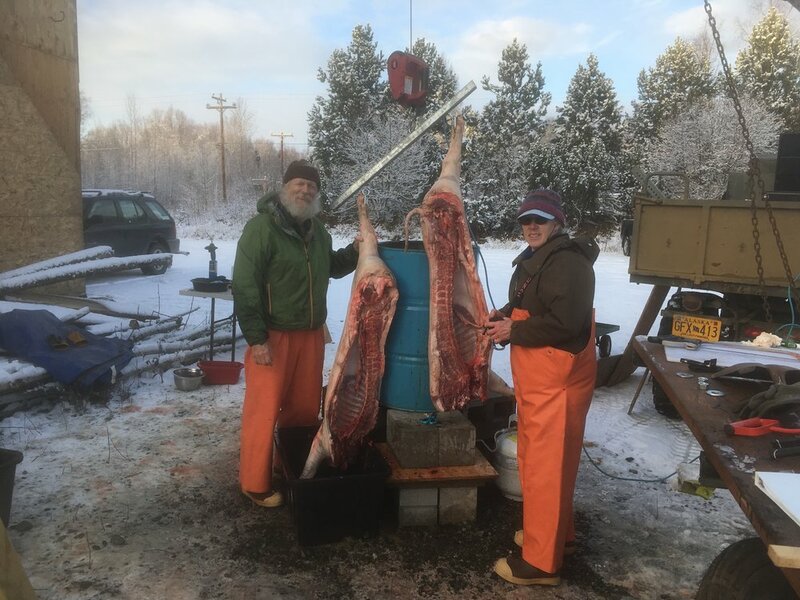 So that’s what we did, we had a great butchering gathering at The Grove, where we all shared in the many laborious tasks that go into slaughtering and butchering a pig. It really was a great experience that saw a team of folks coming together in the name of responsible food production, learning a traditional practice, becoming closer to their food – literally and metaphorically. This was indeed a highlight of the summer and of my young farming career! We are undeniably smitten with pigs. So, we doubled down on the pig operation and somehow recently acquired 5 new pigs! All we really wanted was a boar to breed Gretel and Rita, her daughters. But as so often happens, when people get rid of livestock, they’re often tending to rid them completely of that particular livestock and offer very good deals for the whole lot. Hence the other 4 pigs. Of these 4, one is a sow that is supposedly pregnant and about 3 months out from giving birth, another is a sow that was not pregnant, but hopefully is now. Another is an old sow that we have planned for butchering for ourselves. And the last is a young boar that was thrown into the mix just for the heck of it. So we are hoping to have LOTS of piglets running around the farm this spring and summer. Who wants one?! Get on the list! Spread the word! 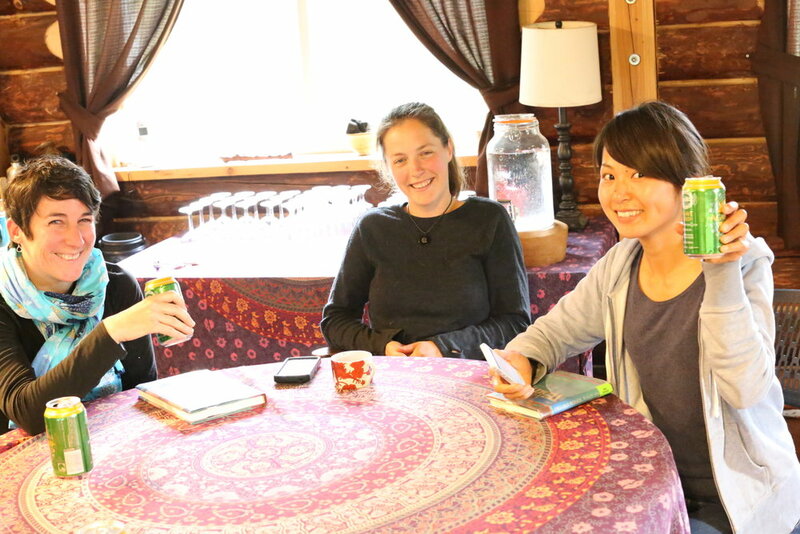 Finally, the big move to hopefully make The Grove a truly sustainable entity, is the decision to turn the property into nightly accommodation for those travelling to Talkeetna. Nightly rentals were not our first option, but long-term leases simply were not contributing enough to our monthly mortgage payments. We wanted to be here exclusively for Talkeetnans. But after thinking about, this is not at contrary to our desires to share our farmstead and our practices with others. In fact, nightly rentals will likely result in spreading what we’re doing even further. And it’s not as if Talkeetnans won’t still be a part of The Grove. Anyhow, we could sure use all the help we can getting those needing accommodation staying with us at The Grove. If you perhaps own established lodging in the Talkeetna area and are booked up at any given point, or have friends or family coming to visit, know folks from Anchorage coming up, whatever the case, please consider telling them about The Grove where they’ll get comfortable, warm lodging, a close look at farming in Alaska, use of an incredible community room in the main cabin with timeless, local artwork, etc., etc. All our best to you all! I know I always says this, but be on the lookout for more newsletters and updates in the future. Oh, and check out the website that is STILL being worked on, but good enough to put out there – thegrovetka.com.